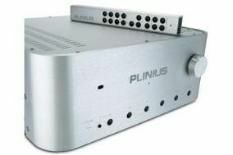 Plinius Hiato review | What Hi-Fi? Conventional wisdom prevails that pre/powers are the way to go when it comes to high-end amplification. Plinius's range-topping integrated, the Hiato, suggests conventional wisdom needs a serious rethink. The Hiato has been a long time coming, but it was well worth the wait. The price listed here is for the standard line-level version. You can buy an optional phono stage module – our review sample was so kitted – adding almost a grand to the cost. The Hiato's phono stage has adjustable gain, and is quiet enough to cope with low output moving coils. The rest of the amplifier is much as expected. It's impressively built and finished – just as you'd hope for at this high price point – and it's decently featured for this type of product. You get a remote control (one of Plinius's chunky yet classy handsets) as well as a full set of balanced and single-ended connections. There's also a home theatre input that bypasses the volume control, sending the signal straight through to the power amplifier, so allowing the Hiato to integrate into a home cinema set-up. You even get a front fascia mounted 3.5mm jack for use with MP3 players and the like. Handy, but we can't help but feel such sources are rather too limited in quality (for a product in this class) for anything more than occasional use. Like most amplifiers, the Hiato needs a certain amount of running-in to perform at its absolute best. Heard straight from the box, this machine sounds rather hard and bright. There's a clunky lack of subtlety that's likely to disappoint those used to the performance at this kind of elevated level. But as the star rating suggests, all this changes given a week or so of continuous use. Once properly bedded-in, the Hiato is something of a sonic superstar. Before we start gushing about all it does right, let's talk about this amplifier's (slight) weakness. In absolute terms this isn't the most transparent machine you'll hear: it has a little too much character for that. There's a slight lack of openness in the presentation and the tonality isn't quite as pure as we've heard at this level. Does any of this spoil the musical experience? Far from it, but if you want to hear the production differences between discs as clearly as possible, other products do a better job in this respect. That said, if you believe that a hi-fi's main job is to make your music as enjoyable as possible, whatever the genre, don't hesitate. The Hiato is an utterly engrossing amplifier, one that gets straight to the heart of the music with unwavering accuracy. Challenge it with a dense recording like Arvo Pärt's Tabula Rasa and this machine will respond with plenty of insight and passion. Dynamics are forceful and the level of insight is impressive: the amplifier stays in total control despite the mass of instrumentation. Switch to the likes of Lady Gaga and the Hiato responds with a great deal of enthusiasm as it charges along with tracks like Just Dance. There's plenty of punch and the kind of sure-footed timing that's hard to better at this, or indeed any price. More than most rivals the Hiato has the ability to draw the listener into the music and keep them involved all the way through. It's the kind of amplifier that has you listening deep into the night when all you wanted was a half-hour diversion. Sadly, the phono stage isn't quite as impressive. It maintains the Hiato's charming character, and remains enjoyable to listen to, but if we were serious about vinyl replay, that extra grand would be spent on an outboard unit such as Roksan's Caspian Reference phono stage: the Caspian has a degree of finesse and insight that the optional Plinius phono module can't match. Nevertheless, the Hiato is a staggering integrated amplifier. It stands toe-to-toe with the best pre/powers at the money and is good enough to knock most of them out with its combination of build, dynamics and timing. If sheer entertainment is your priority, we can't think of a better alternative at the money.